Our New and Beautiful Location! Best of 2018: Writer's Block Picks! New York Times Notable Children's Books of 2017 When you go off to sleep, your toys go out to play After a long day of jumping in leaves and reading her favorite books, this little girl is wornout, but her favorite stuffed animal, Planet, is just getting started. Planet befriends a dog, gobbles a cookie, and takes a leap into the unknown. 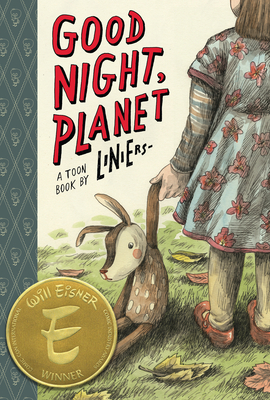 This tender, gorgeous tale by the internationally renowned cartoonist Liniers will reveal to early readers the wonders that exist at night, in secret, after they close their eyes. Liniers's US debut, The Big Wet Balloon, was selected as one of Parents Magazine's top ten, and his follow up, Written and Drawn by Henrietta, was named one of School Library Journal's Best Books of the Year. Liniers is from Buenos Aires, Argentina, but he now lives in Vermont as the artist-in-residence at the Center for Cartoon Studies with his wife and three young daughters. They have fallen in love with the New England landscape, the house they live in, the night sky, and the family's new puppy, Elliot, all of which figure prominently in this book.